According to the first president of the Supreme Court, Adelbert Makay Ngwey, the Court should give its decree tomorrow on the complaints over the date of 29 October next, as envisaged by the Independent Electoral Commission (IEC) in its electoral calendar. 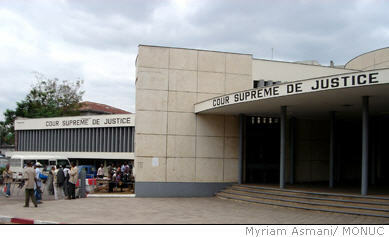 The Supreme Court has already said that they regarded this date as unconstitutional, because it goes against article 71 of the Constitution, and article 114 of the electoral law, which state that the second round of presidential elections must take place 15 days after the final results of the first round. The IEC, for its part, issued a request on September 5 last for an exemption to be introduced so that the combined elections (2nd presidential round and provincial) could take place on 29 October 2006, as envisaged by the electoral calendar. The Supreme Court must rule on this request and will publish a relative decree tomorrow. The IEC have already stated that a second round date before October 29 would not be realistic. This is because it would pose serious problems to the successful holding of the polls, due to the immense logistical effort that is required. The official results of the first round of the presidential elections will also have to be announced by the Supreme Court in the days to come.